Many years ago I wrote for a metal magazine called “Battle Helm”. I took care of “the goth pages”, a section with non-metal music. For the website I made some kind of introduction into ‘goth music’, saying a few things about the styles and presenting photos of the audiences. As you can see in the other stories, “gothic” is an umbrella term, a “scene” covering a whole range of music. When you are familiar with the scene a little, it is often relatively easy to tell what is the main kind of music that a person listens to just by looking at him or her. Somehow people like to extract their identity from some (sub)(sub)culture that they are in. Now things are of course not so black and white. (Almost) all people listen to different kinds of ‘goth’ or even music from other scenes. They might just like the ‘look and feel’ of one of these genres, dress up according to the concert they go to or just find their own style regardless of what other people look like. Especially with the average age of goths getting higher, the number of people looking (relatively) normal raises (most people do not go to work with a mohawk) and it seems that the older you get, the more varried your musical taste becomes and the less obvious it is to adopt the ‘style’ of one of them. 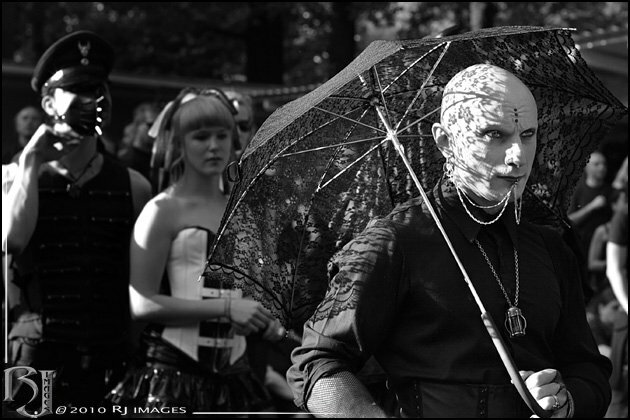 In any case, at a festival such as the Wave Gotik Treffen in Leipzig (annually at Whitsun) almost all gothic subcultures come together. Let us have a look and try to put these people in convenient boxes. Most of the photos that I use are from the WGT photogallery. With this I mean no offense to the people on them or the people who took them. Drop me a note when I crossed a line. As you probably know, gothic rose somewhere in the 1980’ies when black was the colour of fashion and people has The Cure like haircuts. That look is still present, usually among the older goths. Do you see that guy on the far right? That is the genuine “gruftie”, probably a ‘deathrocker’, a vintage kind of figure. Your eyes probably were first attrackted to the group that the photo was made of I guess. The group is rather typical for a young and moder gathering of goths. The bright colours are something of the last decade. Initially these people were referred to as “techno goths”. They listened to EBM, but also to The Prodigy. Nowadays? I do not know, but the style is becoming general and bright colours and yellow mohawks also turn up at industrial concerts. In any case, the group is obviously about half as young as the genuine gruftie, which is the case with most of the people looking like this. But of course I should not forget to tell you that there is another ‘vintage gothic’ look. Goth originally sprang forth from punk and the real punk look is also still present. When thinking about goths, many people nowadays more likely will have something like this in mind. It is this medievalish / romantic style that brought the sympathy of the general audience. Nothing offensive, obviously created with care and money. There is not much saying what music these people listen to, but it will probably not be any of the more extreme forms of music. Probably a medieval gothic rock band such as Faith & The Muse or something. There are many, many of these goths nowadays. They are often of the first new wave of goth, so now in their 30’ies, working, having a family and not needing eye-catching (such as strange hair, tattoos or piercings) when not at a concert. It is a truely romantic style. Quite similar, but when you look at the hair, you already see that this style is for people who do not want to be ‘not goth’ in ‘normal life’. It is still very goth, but can mostly be seen among younger people who do not need to apply for jobs or please an employer. Especially at a festival such as the WGT, the styles get more extreme. I have the idea that this has little to do with music. These gasmasks are getting more and more popular. Back to music styles. There are a few danceable kinds of gothic, EBM (or electronic body music) and electro (and many more terms). The audience of these kinds of music often look similar to industrial and neofolk audience. The style is simple, all black and often uniform-like clothing and army boots. Somehow you can tell an industrial listener from an EBM or electro listener. The industrial fellow more often has a shaven head and looks a bit more military. Of course these differences are also in the details. Bandshirts (of course) or the use of symbols. In any case, it was not easy to get images of the more military style of the industrial, martial industrial and neofolk audience. This is probably because they do not look interesting enough for a photographer and, even in Leipzig, their performances are much smaller (and many of these people try to stay away from “the gothics” as far as possible). Some smaller pictures from different sources therefor. Uniforms, or rather uniform-like clothing, I said it. Offensive in combination with other symbolism to some. 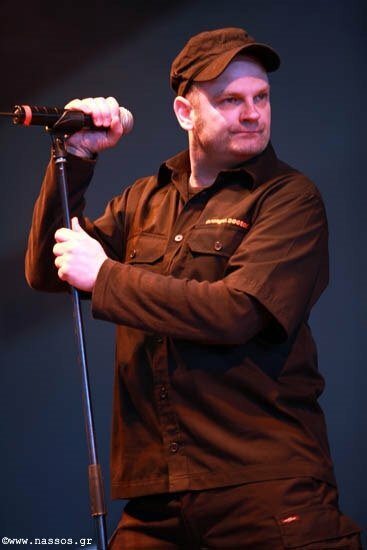 Since neofolk is easy-listening music, it is relatively more popular and the style (or the audience) is more fashionable. There are more ‘real’ uniforms at those kinds of concerts. I probably forgot a style or two, but these are the ones I could easily present to you. I hope you enjoyed it. Now do not become prejudiced by my black and white story. Not everyone who listens to neofolk wears a uniform and not every uniform listens to neofolk, but just to give you an idea of the variety the clothing styles and their (possible) link to musical styles.